BANGI, 6 November 2014 – Malaysia should introduce laws to deal with hazardous nuclear wastes in anticipation of the setting up of its first power plant by 2021. 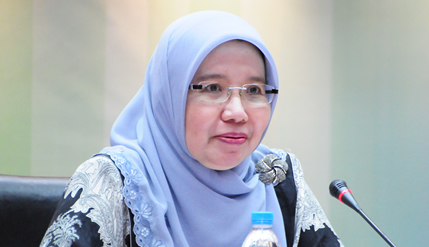 Dean of the Faculty of Law of The National University of Malaysia (UKM) Prof Dato’ Dr Aishah Bidin said there is a need to ensure that the disposals of radioactive wastes strictly adhere to a comprehensive set of laws. She said laws already in place in the country on handling ultra hazardous disposals is confined to scheduled wastes generated from manufacturing and municipal solid wastes but not from nuclear power generation. She proposed the government to seriously review current laws in order to comply with all ten conventions of the International Atomic Energy Agency’s (IAEA) Nuclear Non-Proliferation Treaty. Malaysia has so far fulfilled only four conditions of the convention. There are some basic requirements that must be fulfilled, such as protocol for safeguards, Nuclear Terrorism Convention and Civil Liberties. Malaysia has yet to address them, she said. Prof Aishah said there are challenges in Malaysia, such as ensuring the general public is fully aware of what’s in store for them when a nuclear power plant is established. There would almost certainly be opposition about such an endeavour which requires negotiations with the people directly involved. Experiences with the Lynas disposal plant in Gebeng, Pahang showed that no such undertaking had been done at all to reassure the local residents, Prof Aishah said. To complicate matters the proposed plant is to be built on temporary occupied land (TOL) which has to be periodically renewed. She said the public will be exposed to many potential hazards if the disposal of such materials is not managed well and fails to comply with regulations. The congress was opened by Deputy Vice-Chancellor (Research and Innovation) Prof Dato’ Dr Mazlin Mokhtar.